Okay, I know Tula Ammo is cheap. But I’ve been using it in my 9mm for a while now and have had no problems. In fact, it seems to run better than some other brands of ammo that I put through my 9mm. Some people say it’s dirty ammo, but far as I can tell, it doesn’t dirty up my gun any faster or worse than any other ammo I’ve used. Maybe some day I’ll do a throughout experiment on the dirtiness of different ammunitions, but for now I just have a glimpse observation and I don’t notice a difference. I buy Tula Ammo because it costs less than pretty much everything else. The Tula Cartridge Works, as a company, has a long history. They’ve been a manufacturer in Russia since 1880 (I’m not sure if The Tula Cartridge Works is part of Tula Arms Plant, which has been making guns in Russia since 1712.). So, I wouldn’t dismiss Tula as a maker of junk. If you have a Russian design, such as an AK-47, SKS or even one of those Mosin-Nagants,, I think Tula Ammo will run like a dream through it. But there are non-Russian designs that don’t like Tula Ammo. The other day, for the first time, I tried .357 Magnum Tula Ammo. I loaded the six chambers of my Rossi R461 and fired at the target twenty feet away. No problems there. It fired like it always had. But when I rolled out the cylinder to remove the empty casings, the casings were stuck. The empty casings couldn’t be pushed out and they couldn’t be pulled out. I had to hammer a screwdriver in through the front of each chamber. That’s what it took to get them out. It wasn’t terribly difficult, but it was a hassle. I tried the Tula Ammo twice, shooting a total of twelve rounds, just to be sure. It was the same thing with all of them. Every empty casing was stuck in its chamber and could only be removed by hammering a screwdriver in through the front. My dad and I inspected the empty casings. The casings were swelled. That would be why they were stuck in the chambers. My dad has a tool for measuring things down to millimeters. He measured the widths of a live .357 Magnum Hornady round and a live .357 Magnum Tula round. The Hornady measured 9.59 millimeters and Tula measured 9.56 millimeters. I’m not a hundred percent sure that this is why it’s happening, but I think because the Tula is a pinch thinner than the Hornady that there is space in the loaded chamber that gives the Tula room to expand when fired. I didn’t have any other .357 Magnum brands, but my dad had a .38 Special round that he also measured. .38 Special can be fired from a .357 Magnum pistol. The Tula round was a pinch thinner than the .38 round. So, it would seem that Tula .357 Magnum rounds are thinner than they’re supposed to be, which might very well mean they have room to expand in the chambers. I think my gun might have been damaged if I had continued firing this ammo. I won’t be using anymore Tula in my .357 Magnum revolver. Thanks for the info, I am in the middle of investigating the same exact problem, same gun, happened first time I put Tula 357 mag in it, just after firing some old 38 sp military rounds. I’ll buy some better ammo and try it and measure it before and after. 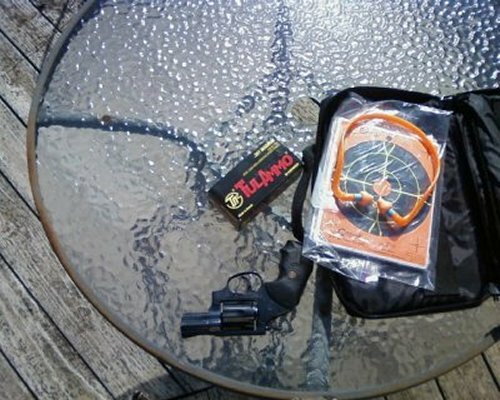 I’ve run different brands of .357 Mag ammo through my revolver and haven’t had any problems. I wonder if The Tula Cartridge Works tests this ammo before they box it and send it out. Since I wrote this entry, I’ve heard about people having the same problem with a bunch of different revolvers, including the more popular makes like Smith & Wesson, Ruger and Colt. Had the same problem yesterday with my GP100 and with a Chiappa Rhino.